Herman Charles Bosman has woven many a tale about Abjaterskop and the Marico River. It is perhaps he that best describes the vast area where enselbergs rise from the savannahs and an area that is given life from the Marico River. This is the Madikwe Game Reserve, 75,000 hectares of unique topography and breathtaking beauty, it is also home to the big 5 and a large variety of mammal and bird life. A Tswana word meaning word meaning 'A Gift from God'. The lodge features a magnificent feature pool which looks over onto an active water hole, during the heat of the day much is observed from the pool or from the nearby viewing sala. Breakfasts and lunches are enjoyed on the pool deck while dinner is in the boma. For those wanting peace and tranquility nothing can beat taking a book from the library and whiling away the afternoon in the sala. Daily dawn and dusk / evening game drives are conducted in open landrovers by qualified rangers and Shangaan trackers. Walks are also available. 2 daily game drives per day. LAST MINUTE RATES ARE SUBJECT TO CHANGE AT ANY TIME. Rate is per person sharing per night for a minimum of 2 nights in a Luxury Suite, valid for travel till 30 June 2019.
accommodation, all meals, teas and snacks, select local drinks, 2 safari activities per day and 50% off massage treatments. All levies, premium drinks and items of a personal nature are excluded. Rise in the morning to an African dawn and enjoy an early morning game drive with your dedicated professional ranger and tracker. Relax as your ranger guides you through the bush on a custom made open Land Rover searching out the secrets of nature. In the afternoon, when the heat of the African sun has diminished and the shadows are longer, head out on a sundowner safari to watch the sun set on this bushveld paradise and go in search of the more nocturnal creatures that now rule the bush. Impodimo has the advantage out during the safaris, in that we have talented trackers on each game viewer that assists the ranger in finding the animals. Trackers make an immense difference as they have the ability to see and read the signs of the bush that others might have missed. Children of all ages are welcome at Impodimo and we love to go out of our way to ensure that kids and parents both have an unforgettable safari experience. Our kiddies program is tailored to the different ages and can be fun and educational for all. Each child receives a personalized welcome pack with goodies and activities to do in between safaris. Children over the age of 6 years are welcome on the game drives, however, families with younger children need not fear that their kids will miss out, as we offer a ‘kiddies bumble’ which is shorter and aimed at keeping the little one’s attention. Enjoy a sumptuous brunch at the pool lapa on return from your morning game drive, high tea in the afternoon overlooking the African Bush and the finest Pan-African cuisine with your hosts in the open air boma and share your adventures while you enjoy a night cap around the fire. In our cooler winter months, we offer our guests the opportunity to explore the other side of the park with the ranger and tracker. Spend a day out in the bush, stopping for a picnic lunch in the shade. A day in the bush is not complete without an in room massage treatment out on your private deck by one of our experienced massage therapists. Impodimo is situated 350 kilometres from O.R Tambo Internal Airport (Johannesburg). Road transfers can be arranged from Johannesburg or from Gaborone. Air transfers are available on a daily basis from OR Tambo International Airport to and from Madikwe. Drive from Johannesburg to Magaliesburg along the N14 and the R 24. 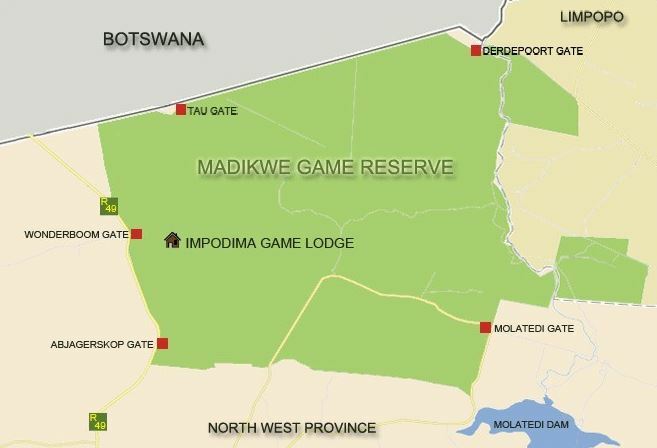 After entering Zeerust, keep straight on until you see a sign for Gaberone / Madikwe Game Reserve. Turn right there. Continue on this road through 2 rural villages and past Madikwe Road Takeaways (a store and filling station) and past Nietverdiend (a store, filling station and police station). Continue on this road past the Abjagterskop Gate for Madikwe Game Reserve on your right. (Thatched entrance with flags etc.) for 7km. 7 km past the Abjagterskop Gate, you will find another gate (Wonderboom gate) on the Right into the park. We will meet you here. Single supplement–50%of the per person sharing rate. Children under 12 years – 50% of the per person sharing rate when sharing with 2 adults in a Luxury Suite, on request only. Additional children under 12 years – when sharing with 4 adults in the Deluxe Safari Suite will be charged 50% of the Luxury Suite rate. Luxury Suite – Accommodation, all meals, teas and snacks, select local and imported drinks, 2 daily safari activities and VAT. Family Safari Suite – As above and full use of the unit & sole use of safari vehicle with your private ranger and tracker. Deluxe Safari Suite – As above with Family Safari Suite and includes private chef with all meals catered for at the unit. Note - The Family Safari Suite and Deluxe Safari Suite is the SAME unit that is sold 2 different ways. select premium brand drinks and items of a personal nature. Please note a surcharge may apply to certain dietary requirements. Fully Inclusive Supplement available on request – per person, per night – local drinks only. A non-refundable 20% deposit is required to confirm any reservation. Full payment of the balance is due 7 days prior to guests arrival, unless the booking is made within 30 days, in which case full payment will be required to confirm the reservation. 30 and 15 days prior to arrival – 50% of the total amount will be due. Children under the age of 6 are not permitted on safari, and where possible, a kiddies safari will be arranged between normal safari times. The lodge reserves the right to impose similar restrictions for family unit guests if it is believed that safety may be compromised. Baby sitting facilities can be arranged at the lodge at an additional charge. A minimum of 2 nights stay is required over weekends, long weekends and public holidays. Please note that there are road works between Johannesburg and Impodimo and we advise to add an additional hour driving time to your journey. Please take this into consideration should you wish to make it for the afternoon game drive.